Place the flour in a deep bowl. Place the Cheerios™ in a food processor and process until they gain a powdery consistency, and then put them in a second bowl. Beat 2 tablespoons water and the egg in a third bowl. Cut the fish into 1/2-inch to 1-inch strips. Coat fish in flour and shake off the excess flour. Dip fish in egg mixture, and cover in grated cheerios. Place on a baking sheet coated with cooking spray. Coat fish with cooking spray. Bake at 375°F for 25 minutes or until crisp. Sprinkle fish sticks with salt. This recipe can be prepared with any type of fish, shrimp or chicken. 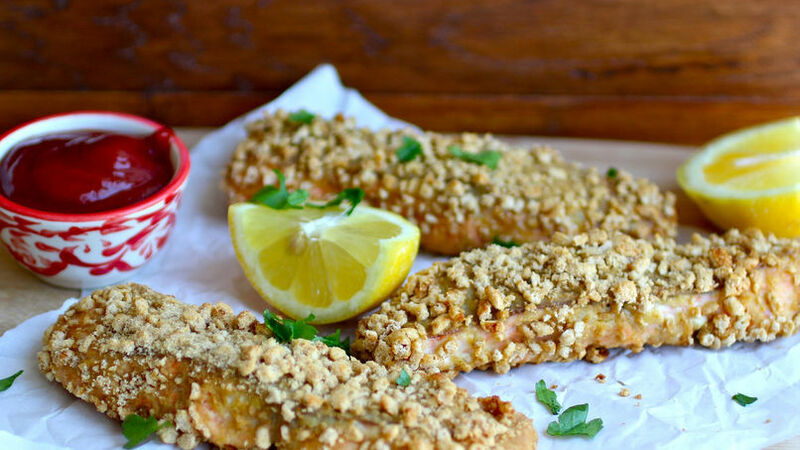 Fish sticks are a favorite food among children, and when covered with Honey Nut Cheerios™ make for a quick and tasty dinner to enjoy during the week. My kids love this recipe, but I know that many children do not like the taste of fish, so it's important to make varied and fun recipes, so adding fish to the menu little by little will get them used to the taste. This is an easy recipe with little preparation that allows us enjoy a rich and delicious quick lunch recipe for the whole family. In this occasion, we'll make the dish more wholesome by baking them in the oven.